From today until next Friday, April 22nd, the free KTQ50 films are Taylor Chain I (1980) and Taylor Chain II (1983). "Blumenthal and Quinn preach nothing; they simply show us determined people fighting for better lives." 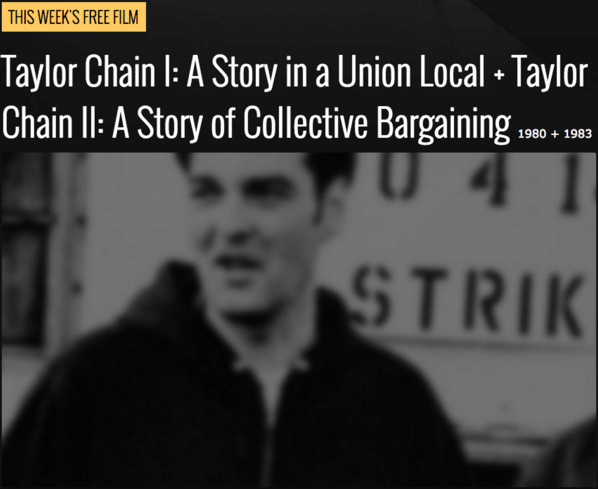 Taylor Chain I: A Story in a Union Local depicts the gritty realities of a seven-week workers' strike at a small Indiana chain manufacturing plant. Volatile union meetings and tension-filled interactions on the picket line provide an insider view of the stresses and conflicts inherent in a democratic union. Taylor Chain II: A Story of Collective Bargaining, the filmmakers return to the Taylor Chain plant ten years later, in the middle of a recession, to capture the collective bargaining process. Amid anti-union legislation, global competition, and increasing pressure on both sides, labor and management must work together -- against great odds -- to save the plant. Together, the films received praise and recognition at several festival throughout the world winning the William Friedkin Award at the Chicago International Film Festival and an honorable mention at the American Film Festival. It was also the first Kartemquin film to be nationally broadcast on PBS. In 1984, the Village Voice called Taylor Chain II, "One of the most startling events in the history of television documentaries was the live unfiltered broadcasts of the McCarthy hearings - Jerry Blumenthal and Gordon Quinn's tape has some of the same excitement. They were allowed to film extremely heated union caucuses and the entire round of contract negotiations at an industrial plant in Hammond, Indiana. Their cinema verité style makes the union meetings in Silkwood look as thrilling and substantial as a bowl of mashed potatoes." - POSTER original poster art for the film. - INDUSTRIAL STILLS of Gordon Quinn, Jerry Bluementhal, and Jenny Rohrer hanging out at the factory. Both Taylor Chain I and 2 are available on DVD here.